When it comes to a pair of headphones, it is all very personal. 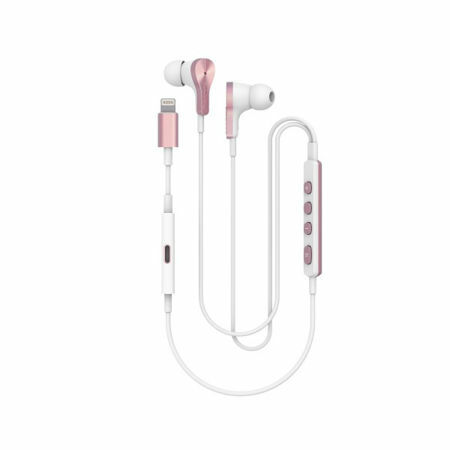 Pioneer and Onkyo have come up with what they call a brand new “Smart Mute” feature for not only the Rayz, but also the Rayz Plus Lightning earphones, in addition to a slew of new Rayz Plus colors (Black and Rose Gold) that will be made available exclusively at Apple.com. If you prefer to shop at a brick and mortar store, then you can also pick those headphones up at Apple Retail stores worldwide. First things first — the Rayz Plus happens to be the first and only Lightning earphones that sport an inline charging node, enabling you to juice up the iPhone as well as tune in to music or carry a conversation simultaneously. The Rayz Plus makes use of Apple’s latest Lightning audio technology, which is powered by Avnera Corporation’s LightX platform so that mobile consumers will be able to enjoy a simple yet smart solution. What of the “Smart Mute” feature? This particular feature for the Rayz and Rayz Plus will automatically mute the microphone whenever a user is not speaking, while unmuting said microphone when the user starts to speak, making it the perfect tool when you are engaging with a phone call within a noisy environment. The Smart Mute feature is enabled after downloading the latest Rayz app for iPhone, iPad and iPod touch on the App Store while performing a Rayz software update. Just to make sure that your pair of Rayz Plus is going to match your iPhone’s color, potential customers are able to check out this pair of headphones in either Black or Rose Gold shades that are available on an exclusive basis. This is one particular instance where waiting is better than being an early adopter, fashion-wise.